When you create an event you’ll want to make sure that where it’s taking place is reserved and that all of your guests get invited. In the Event details page, find the Add section and click Guests. Type the first few letters of a person’s name or email address in the box. Matching addresses in your organization’s directory appear as you type. Click one of the suggestions to add that person to the event. 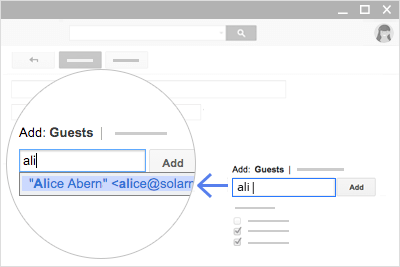 If no suggestions appear, type your guest’s full email address and click Add. You can even add a Google Groups mailing list address to invite a large group of people at once, such as your whole team (For example: [email protected]), or the entire organization (For example: [email protected]). In the Event details page, find the Add section and click Rooms, etc. (Optional) To see only available resources, check Show only available. Start typing the room or resource’s name and click one of the suggestions. Or, browse the list of resources and click Add next to an available resource you want. *Your G Suite administrator must first set up Calendar resources for your organization.